Some of you will be familiar with Roger Brook - the no dig gardener blog. Last Sunday, Roger opened his garden to raise funds for The Yorkshire Arboretum. As Roger's garden is within reasonable travelling distance from us, we decided to pay him another visit - we have been to previous open days at Boundary Cottage. As always, we arrived armed with our cameras so I thought that I would share some of my favourite images of the visit. As you enter the main part of the garden the first feature to catch attention is a pair of ponds. From there down at the bottom of the garden you can wander between large perennial beds which in parts is reminiscent of wandering along a woodland path. I always find silver birch trees to be really photogenic and Roger has quite a few. Leaving the woodland atmosphere the garden opens up and is composed of large islands beds set within a lawned area. Despite the early end to the growing season this year, Roger's garden had plenty of colour. Lots of plants were still in bloom. The insects were making the most of the remaining flowers. 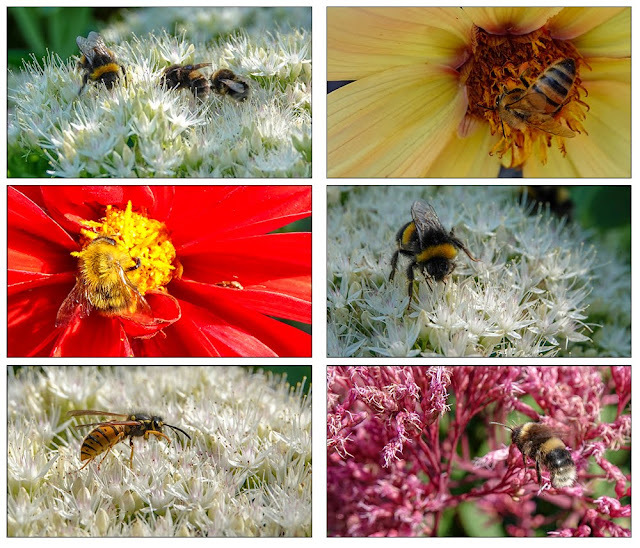 I didn't even notice the bee in the photo, middle left of the collage below, until I downloaded the photo. Roger has more or less abandoned vegetable growing and sowed the area previously used as a vegetable patch with annual flowers. More food for those foraging insects and reminiscent of a wild flower meadow. Roger still packs one of his greenhouse with tomatoes and was growing quite an unusual variety called Albenga. It's a large ox heart type which we are considering growing next year. We came away with a sample. Just before we left, I couldn't resist catching the no dig gardener in the act of using a spade! In his defence he was using it to dig up some pieces of alstromera for us to take home. Of course, before heading home, we had to sample the refreshments provided by Roger's wife, Brenda. It would have been rude not to. Thank you, Brenda and of course Roger for the goodies. If you would like to see more of the photos that I took of the garden at Boundary cottage, I have created an album here. The album also shows photos at a larger size and of better quality than in Blogger. As is often the case, Martyn concentrated on filming and has put together a video of our tour. Thank you so much for taking these lovely pictures. It was great to meet up with you and Martyn again. I am just amazed at your professionalism in your presentation. It is superb. Is it ok if I use some of these pictures in the future - with credits of course? We enjoyed meeting you, Brenda and ye new addition yo your family, Roger. Of course you can use the pictures. Let me know I you want any originals. Whatever did you think people would think? They might think I cannot spell plum! 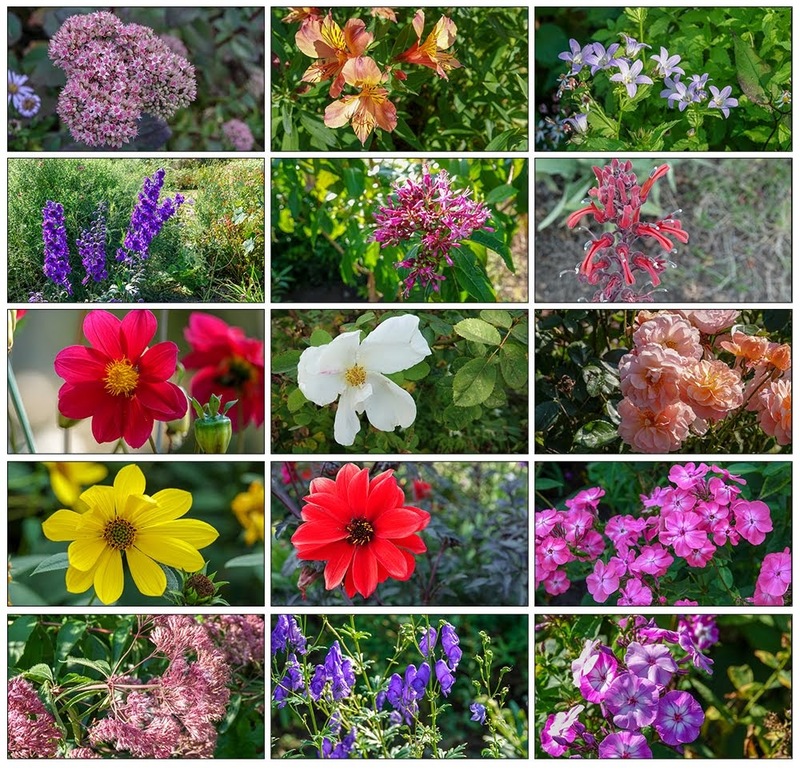 What a lovely post - beautiful photos of a stunning garden. The island plantings with the different textures, heights, and colors are wonderful. It's an amazing garden. I would love a garden big enough to do something similar Phuong. I love the meadow. I’ve often been tempted to try one but apparently it’s harder than it looks! Roger said that he just scattered a mix of seeds but the ground had been used as a vegetable patch so no grass. I was really lucky with the timing - in late April the soil was very wet and with no digging I just scattered the seed and nature did the rest with this long dry Summer. There was no watering! The year before it was dry and harder to get everything going. The hose pipe was needed. Oh that looks a most interesting garden to visit Sue and what a fabulous meadow. Interesting garden and no dig gardener, Sue. I have known this idea to not dig the ground, they say it conserve the soil in better conditions. Maybe. Thanks for sharing your photos and thank Martin for his video, I liked it. Roger's No Dig method is paying off dividends, such a beautiful garden with so much interest. You’ll have to visit on the next open day, Jo. I’d never seen a bee that colour before, Dina. Thank you for the tour Sue, I enjoy reading Roger’s blog.